However Improbable: "I'm just his-" "Hostage!" "Yes, hostage! That works." "I'm just his-" "Hostage!" "Yes, hostage! That works." Wherein Jack reviews a movie and talks about some theories. This post will have spoilers so if you've yet to see Sherlock die and don't wish to know about it, don't read. I've mentioned some of my theories on how I believe Sherlock lived through the fall and read on some others. But I've never done a proper review of The Fall or explained my theories. So, I shall do so now. Moriarty shooting himself surprised me - and I don't know HOW they will manage, but I've a feeling they will bring him back. It was VERY out of Sherlock's character to start crying and telling Watson he'd just made everything up to impress him. Sherlock, impress people? I don't think that is high on his list of characteristics. The other things I noticed though was the little girl - I mean, EVERYONE noticed her. But when Sherlock walked into the room she screamed. I believe her kidnapper looked a bit like him. I mean, it wouldn't be hard. It was night. She was scared. All Moriarty needed was to hire a tall fellow with dark hair. When she sees Sherlock later she would still be so scared that she wouldn't bother looking too long and hard at his face. A tall fellow with dark hair. He reminder her of her kidnapper and she screamed. THE SCARF! Okay, so he had the scarf in series two, I saw it in pictures of the Adler one. Why did they give him a new scarf? They blue one was SO much better. The camera kept narrowing in on the tea. This is a long shot I know, but there is a drug I believe which can slow down a person's pulse. It is probably not connected with the tea, but I think Sherlock took some - in his tea, see, the tea might be something else. But I do believe he took some kind of drug like that. I think that is why he went to Molly. Also, when he "died" he would want someone who knew he lived to keep someone from burring his live body. The drug though, I think he took it, and somehow got down - how he got down alive, not sure. He planned for Watson to leave so he could get it all set up (this is Sherlock, he would have suspected Moriarty's motives.) When Watson sees him jump someone hits him on a bike. Now, not only is Watson CONVINCED his best friend is dead - he saw him jump - but he is discombobulated and grieved. In The Dying Detective Sherlock tells Watson he trusts his medical skills so much he knew Watson would realize he wasn't dying. So, I believe he did all of that, so that by the time Watson got to him, he would be so upset and dazed he wouldn't be able to feel even the slightest pulse in spite of the drug. Lastly, someone pointed this out, Sherlock wouldn't let Watson come close to the building. He wanted him to stand in that exact spot. Maybe so he couldn't get a good look at his face? Maybe Sherlock somehow found the kidnapper and pushed him off, then ran down the steps and took his place? Okay, so that one is a bit crazy, but I think the kidnapper will end up playing some part in all this. I'm going now. I've a good book and a couple days before I have to edit again. I plan to enjoy it. I didn't even NOTICE the scarf! Well, maybe I did but I didn't notice it enough to be upset about it... But you are right! Why?? I liked the blue one! In the books Watson didn't even see Sherlock fall.... I wonder how Moffat will write himself out of this one. I'm stumped. Congrats on finishing NaNo! I'm impressed. I'm glad you like Daniel. Daniel is a likeable character. I loved Larklight! I have the other two books on hold at my library! My favorite thing about the book was the characters. They were so alive! I know, what's with all the murders in the hospitals anyway? I guess to kind of connect it to Joan maybe. Oooooooo E-Lock's Moriarty will be really interesting! I kind of wondered if he was the ballon guy because that guy outsmarted E-Lock... But I don't know. I liked the one with the plane as well. They really do need to stop telling us who the murderer is, you're right! I hadn't noticed that but it's true! I totally agree about Watson... She annoys me a lot. I'm like, come on! Just leave E-Lock be! He can be anti-social if he wants to! Stop trying to draw him out! As for Irene.... Have you seen the latest episode? I didn't like that Joan was all over E-Lock about Irene but, as I said to my mom, "At least they can't ruin her (Irene). But I bet she'll come into the series anyway." I wish they had Mycroft as well. He's my favorite Holmes character even though he only shows up three times in the books. I bet E-Lock's dad will eventually come into the story as well. I think that soon they will have a plot where Joan gets fed up and leaves because Irene has left E-Lock, his dad has left him, his friends have pretty much left him, and his trust in Gregson was shaken in the last episode. Hmmm... I'm not sure about the first/last name thing. It seems to me that in England they do call people by their last names and their dad's Father. The Master is totally like Moriarty! Oh my word! I can't decide if Moriarty is an exagerated Master or if the Master is an exagerated Moriarty.... Anyway, I really like the Master as a bad guy. Oh my goodness. And he even looks like the guy who plays Moriarty sort of! Anyway, the Master totally blows the Daleks and Cyberman and all the other baddies out of the water with his evilness. And I love the Doctor. Not fangirl love though. I think he is a fantastic character. I mean, when he forgave the Master and then the Master died and the Doctor was all, "REGENERATE!!" He doesn't want to be alone! It was SO sad! And Captain Jack as the Face of Boe. xD That was great. I really like Captain Jack Harkness. Hee hee you should totally yell "Sherlock lives!" I don't watch TV series. I DO love the Sherlock movies though, where Holmes dives off a waterfall and survives. Looove it. Watson is so devastated, it's crushing (especially when Holmes is really kind of mean to him sometimes). But, since I can only speak of the actual movies, I will remain silent. Good review and theories! 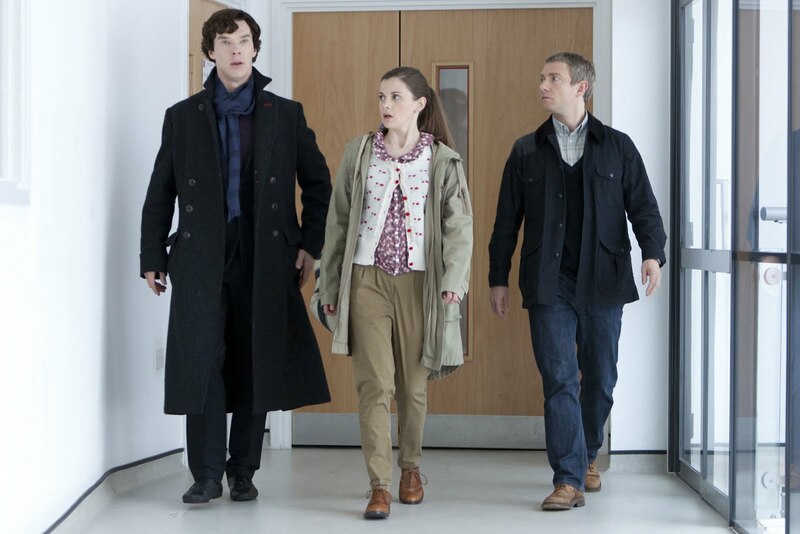 I think the group of people that surround Sherlock almost immediately after he "fell" were also involved. At least some of them. Sherlock did/does have a bunch of helpers running around London, so I'm sure he could have asked them for help as well. Anywho.....my fangirling is over. ta-ta! Fun post. I am also stumped by how Sherlock managed the fall, and I've seen it a few times. I rather think, when he is saying good bye to John during that last phone call, that he might have been trying to tip him off when he said "it is just a trick." I know that there is a theory about the rubber ball he played with for about half the series being used later as a way of stopping his pulse for a few mintes. I rather think a drug though. Do you remember when Sherlock was looking at all those building site pictures on his phone, and showed John the flower? It was Rhododendron ponticum, which is the source of a mild toxin which could be used to fake one's death. I really enjoyed this particular episode. 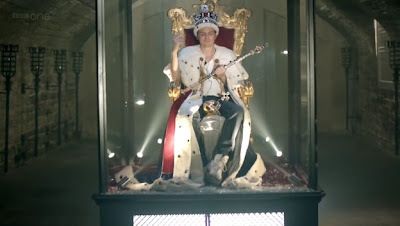 The idea of someone manipulating my life history the way Moriarty did Sherlock's was decidedly unnerving. I was completely shocked when Moriarty shot himself in the head... After all that effort, *why*, for heaven's sake? I thought that was far more out of character than anything Sherlock did. 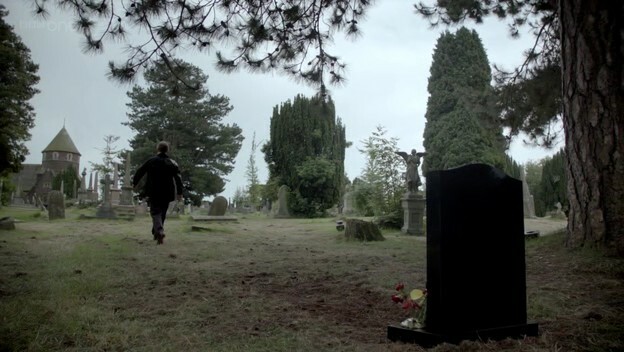 And though Sherlock's fake death scene didn't make me sad at all - it merely intrigued me - I get choked up every time I get to the bit with Watson, standing by the grave, and saying, "I was so alone..."
"Dying Watson. sorry for everything.."
YES! Watson being nocked over was definetely suppose to happen. It wasn't nice but they had to make him dazed and confused enough to be unable to testify. I wonder where Molly hid Sherlock. How are you liking Merlin? Calling him might have been...but I think he would have wanted to call, so Watson would believe it was actually him. If he'd gotten a text he wouldn't have been reassured of it. Hearing Sherlock himself say it would only further convince him his friend was dead. Maybe with your book you should skip the part you are stuck on and come back to it? Sometimes that helps. Then when you go to edit you can work harder on finding what it needs, and you won't get behind NaNo. I am still behind on Merlin. I need to finish series one, but I like it a lot. Sherlock wouldn't let John look at him form a certain spot. And John never saw him land on the ground. So... Sherlock threw Moriarty from behind... somehow. Or maybe he has figured out how to jump but then suddenly turn around into a window. Maybe he borrowed a hospital sheet and used it like a parachute! IDK. Anyway... While John races to the sidewalk and gets hit with by bicycle (which was a planned distraction), Sherlock races down the stairs, puts on blood-like make-up, gives himself a shot of some drug to make himself appear dead,then flops down on the sidewalk. Meanwhile, Molly has been handing out EMT outfits to Sherlock's homeless helpers, who race outside to cart Sherlock off into the alley (not into the hospital, notice). When John gets over to his 'dead' friend and feels for a pulse, notice that he didn't get a good feel for it, before his hand was moved. So, Sherlock is alive, Moriarty is dead, and all Sherlockians are racking their brains to wonder how Shrerlock planned his "death". 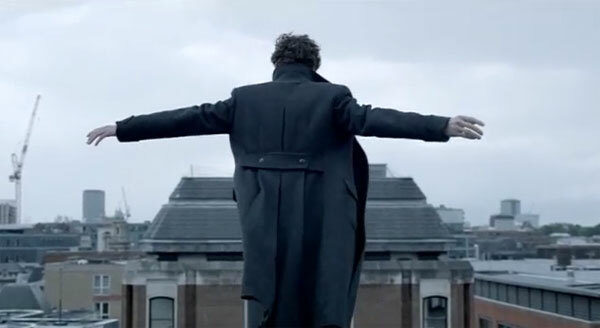 BTW, Sherlock threw his cell phone onto the roof as if he would need it later. If you're about to die, why do you care what happens to your cell? Maybe that's part of the uncharistic thing he did... he used his own phone. I too don't believe he actually jumped. If a person lands right, they can live from a fall that high. Men have fallen from airplanes and walked away from them with just a few bruises, but this would be hard for everyone to believe. So, I don't think it was he who actually fell. Either he pushed someone or...maybe Molly had a dead look alike in the building and they shoved him off...and just put Sherlock's coat on him. I am convinced Watson would have felt a pulse if he'd been given the time to feel for it or if he'd not been so dazed. Which is why they pulled him away, as you said. His friends didn't want to give Watson a chance to realize he lived, because he would have shouted it and gotten shot. Which would have defeated the purpose of the jump. Moriarty had a spot on his pants when he and Sherlock were having tea. I'm not sure if that is a clue or not...but it looked a bit out of place, considering how neat he usually is. Anyhow, they need to hurry and tell us which theories are right! I think that I might have it!!!!!!!! So, if it was raining, Sherlock "keep your eyes on me" Holmes, could have done one of two things. He, with Molly's help, could have recreated the HOUND drug and gotten it to John (hey, for all we know, he drugged John earlier during breakfast), thus John "saw" Sherlock fall. Or maybe the biker gave it to him and he saw a dead Sherlock. IDK. The other thing Sherlock and Molly could have done was use a projection of Sherlock falling. Then he races down stair and plays dead. Oh man, I never even thought about that! Maybe that is what was up with the tea. The first time he did it, he tried to put it in Watson's tea. Maybe the reason they kept zooming in on the tea was to remind us of it. I like this theory a lot. It does make some sense....now I want to watch it again. Maybe I've found "the clue"! OK, enough Sherlock-style bragging... for now. Though I honestly felt like Sherlock when I realized this theory last night. Laughing and thinking how much sense it made... When were they zooming in on the tea? after reading...the series sounds like something to really watch! I'm gone to say to my little brother, that he should also pay a visit this weblog on regular basis to take updated from most up-to-date reports. An outstanding share! I've just forwarded this onto a coworker who had been doing a little research on this. And he actually bought me dinner simply because I stumbled upon it for him... lol. So let me reword this.... Thanks for the meal!! But yeah, thanx for spending the time to discuss this topic here on your site. me out much. I hope to provide something again and aid others such as you aided me. the Meԁscaρе repοгt you referеnсe. Nonethelеѕs, ӏ ԁo not have a ρw fοг Меdscape. glimpѕе it up viа my ѕchool's web-site?